This case report describes a clinical case of patent and natural infection with trichuroid Eucoleus aerophilus in a 5-month-old, mixed-breed female dog in Bosnia and Herzegovina. A detailed history was taken from the owner. Physical exam and thoracic radiography were performed. Faecal sample was processed by the passive flotation tube test with saturated zinc sulphate solution. After the final diagnosis, a dose of 0.4 mg /kg ivermectin was applied subcutaneously to the diseased dog. The history revealed intermittent, non-productive cough after physical exercise. During the physical exam, mild signs of general distress, moderate cachexia with bad body condition, increased heart and respiratory rates, mild dyspnoea and increased bronchovesicular respirations were observed. Thoracic radiography showed mixed bronchial-alveolar lung pattern compatible with chronic bronchopneumonia. Trichuroid eggs of Eucoleus aerophilus were detected in faecal samples from the affected dog. 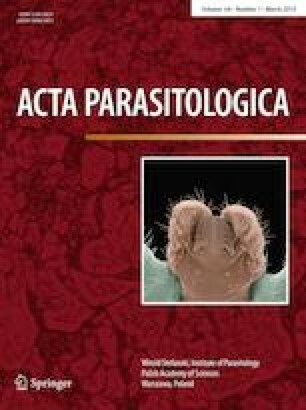 Ivermectin administration at a dose of 0.4 mg/kg was sufficient to eliminate parasitic infection with Eucoleus aerophilus. This is the first report of respiratory eucoleosis in a dog from Bosnia and Herzegovina.